You do not dress for war in order to wage peace. You do not suppress information when you have nothing to hide. You cannot serve & protect a community while you dig your knee into its neck. These would seem to me to be fairly simple truths, but based on the response of the media-industrial complex and the persistent persecution of a systematically oppressed and marginalized section of our society, it appears that they need some fleshing out. In the wake of the recent protests and unrest in Baltimore over the murder of Freddie Gray by several of Charm City’s finest, the average American could be forgiven in thinking that the city had devolved into some sort of post-apocalyptic anarchy. After all, the national media—as is their wont and custom—has neglected to cover the thousands upon thousands of rightfully outraged, yet entirely peaceful protesters in favor of giving all of their attention to the small cadre of residents who splintered off and started raising hell on their own. For the most part, coverage of the Freddie Gray protests has followed the same tired script—one that has been used over and over again throughout American history to vilify black communities whenever they have the audacity to stand up and demand the recognition of their humanity. It is a response deeply rooted in the twin tendrils of racism and capitalism that weave their way in and out of every aspect of American life. In their reporting, the almost exclusively white-owned mainstream press reveals their biases—both explicit and implicit—and exposes the double standard of how violence is framed for the American public. When The Baltimore Sun first placed Freddie Gray’s death on their front page, the paper dispassionately declared, “Gray dies a week after his arrest” next to a small, above-the-fold photo of a few protestors. 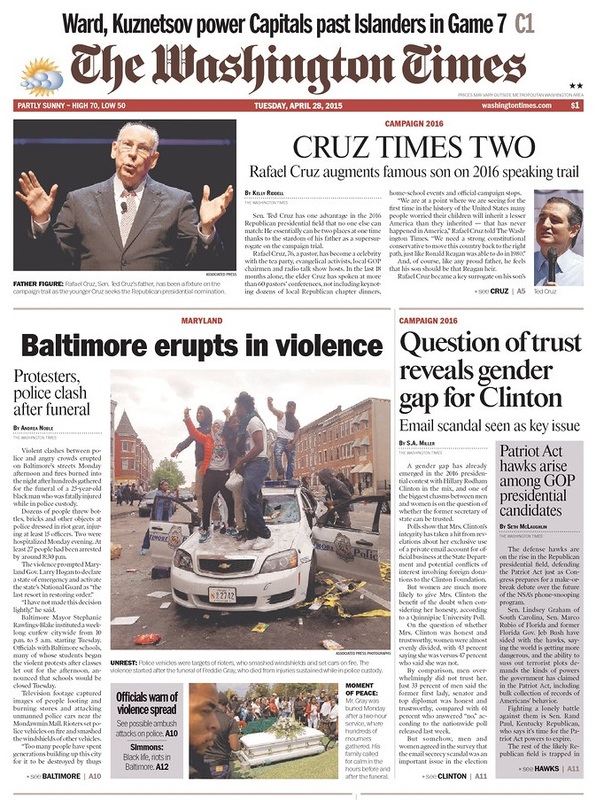 A week later, when the paper covered the predominantly peaceful protests and unrest that occurred near Camden Yards, the paper led with extra-large image of two black teenagers kicking in the front windshield of a car alongside the melodramatic header, “Peace, Then Violence.” The message here from The Baltimore Sun, which is abundantly clear, if not necessarily intentional, is that the destruction of property is more alarming than the destruction of black life. Freddie Gray has 80% of his spinal cord severed, his voice box crushed and three of his vertebrae cracked after being assaulted by a police officer who had no tangible crime with which to charge him and the paper goes about its reportorial business with a yeoman’s detachment and objectivity. 100 or so people respond to the police occupation of a section of their city by destroying property and all of the sudden it’s time to run for shelter because the sky is falling. This is not to pick on The Baltimore Sun, which has done some excellent investigative reporting on the particulars surrounding Gray’s life and death, so much as to point out that even best media outlets are not immune to racially-biased coverage. If you drift away from the attempted objectivity of the Sun towards the realm of right wing bigotry masquerading as journalism, the centuries of anti-black hysteria and hatred become painfully, and often obscenely, evident. Over the weekend, Breitbart covered the protests near the Inner Harbor with an article bearing the headline,“Black rioters in Baltimore smash police cars, attack motorists in frenzied protest”, while Fox News’s Tucker Carlson used the bully pulpit to talk about how the Freddie Gray protests represented, “a threat to civilization itself”. Just yesterday, the folks over at The Washington Times, ran an article with the title, “Intel report warns gang attacks on white cops could spread nationally”, which culled most of its information from a series of internal safety memos by various law enforcement agencies. Many national and local news reported on the supposed threat promulgated by the Baltimore Police of gangs teaming up to “take out” law enforcement, but The Washington Times took it a step further in their insistence that it was “white cops” who were in danger, an assertion that was based off of a report from the West Virginia Intelligence Fusion Center that quoted an officer safety bulletin from a sheriff’s department on Maryland’s Eastern Shore saying that a local resident had contacted them to inform them that someone had sent him/her a text that from a phone with a Chicago area code that read “Kill all white police officers!!”. Essentially, The Washington Times reported on the police saying that their best friend’s sister’s boyfriend’s brother’s girlfriend heard from this guy who knows this kid who’s going with the girl that white cops across the country are in mortal danger. Unfortunately, this sort of journalism that breathlessly exclaims even the most spurious of police rumors while systematically ignoring the cries and pleas of black America is the rule and not the exception. Nothing has changed since Ferguson, when a St. Louis Post-Dispatch crime reporter was allowed to spread unverified (mis)information and police talking points through her articles and Twitter account that would help create a false narrative of the circumstances surrounding Mike Brown’s murder. News surrounding communities of color in this country—particularly television news—still focuses disproportionately on crime, portraying black men as a loosely-knit community of once-and-future convicts. I was fortunate enough to live and work and further my education in Baltimore a few years back—in fact, the classrooms and library stacks where I spent the bulk of my time sit less than a quarter mile from the epicenter of the protests that took place on Saturday. I truly wish that I could be there now to lend what little support I can to the community that has changed my life for the better in so many ways, but I cannot. What I can do is encourage you to turn off your damn TV, because there is nothing that you’ll see on there will provide you with anything approaching the truth of what’s happening in Baltimore. 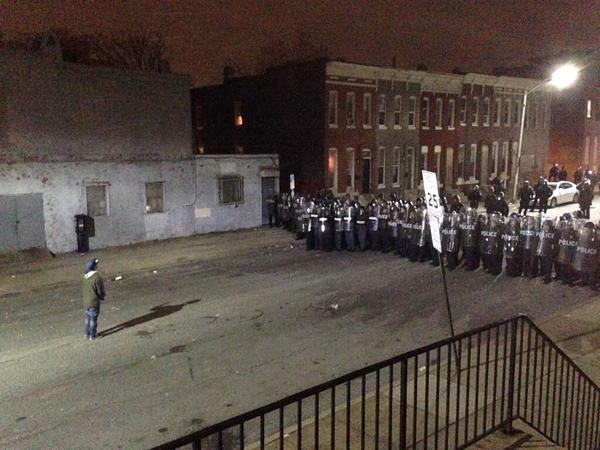 Below is a list of folks on Twitter who have their ear to the ground in West Baltimore right now and who are providing excellent insight, photos and video of what’s going on that you aren’t likely to see on CNN anytime soon. If you look at the list below and see some people who aren’t listed, but should be, write their name and/or Twitter handle in the comments. Or, just maybe, the Baltimore Sun paid more attention to the violent part of the protest than to Freddy Gray’s death because former is much more rare than a yet another story about an unarmed black man killed by the police.